When I heard about the opportunity of sharing my favourite movies and reads, my mind went totally blank. Thankfully, talking with my daughter reminded me of several movies we’d seen together, and that I’d seen with her kids. Now I’m fortified with memories of happy times of sharing flicks as well as a TV series. Starting with books: I immediately came up with a book that I just finished reading the other day. I thoroughly enjoyed it, and that’s saying something, as the books I’ve read lately have happily been returned to the library, unfinished. 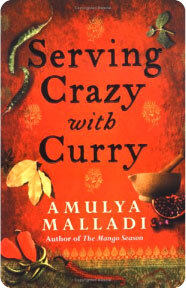 Not Serving Crazy with Curry, by Amulya Malladi. It’s a story about an Indian family who’ve emmigrated to the Bay Area: sisters, mothers, fathers, husbands, boyfriends—and all their interwoven relationships. There’s an underlying theme throughout the book about the main character being an underachiever, especially when compared to her successful sister. The ‘underachiever’ achieves stability and a zest for living through the creation of several curry recipes: she takes over the kitchen from her domineering mother, and keeps a journal of all her concoctions, some of which I made note of before returning the book to the library. Another favourite book is Wilt by Tom Sharpe read when my kids were still in school—and I thoroughly annoyed them when they were trying to sleep by cackling in the middle of the night through the whole story of Wilt—because Tom Sharpe goes beyond the ordinary and creates the most bizarre stories involving condoms, life-like inflatable dolls, and neurotic wives. 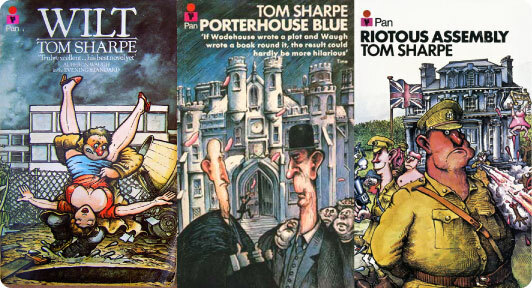 I say stories, plural, since after reading Wilt, I went on to read other books by Sharpe: The Riotous Assembly and Porterhouse Blues. For movies I’ve seen, I’d like to recommend Blazing Saddles directed by Mel Brooks as a great movie to see. If you’re in the mood for laughter and irony: this one is for you. Yet another great humorous, yet satirical movie is Life of Brian. I know that many people have heard of The Holy Grail, but the Life of Brian was the first Monty Python movie that I saw, and it remains my first irreverant favourite. Getting away from movies, but still with the screen, a great TV series is Faulty Towers, which stars John Cleese in the same vein as the Monty Python movies. And for a bonus: another go-to favourite TV series: M.A.S.H. Gotta love all those reruns and that war-time operating room humour!